Are you thinking of adding a few laying hens to your backyard this spring? 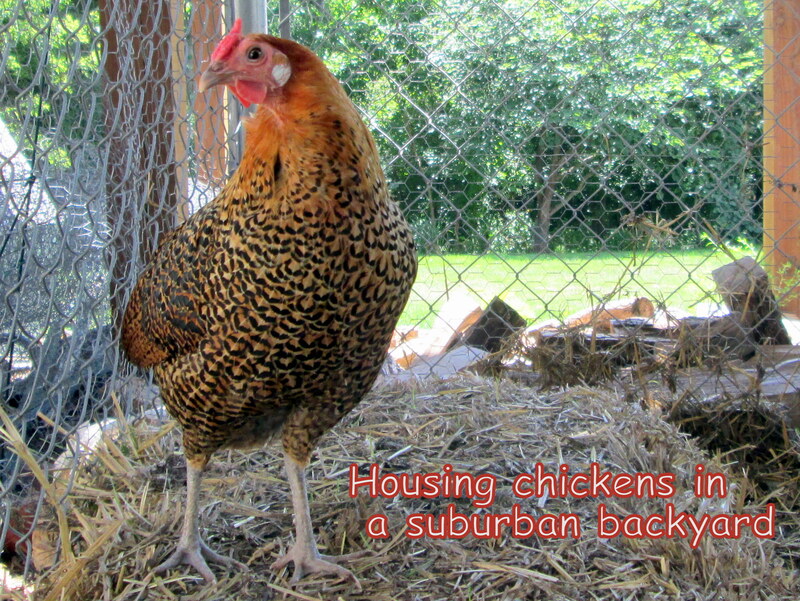 Housing chickens in a suburban backyard may be easier than you think. This guide will tell you how you can provide your chickens with a suitable place to live, access to the outdoors, and protection from predators. This is my only rooster. 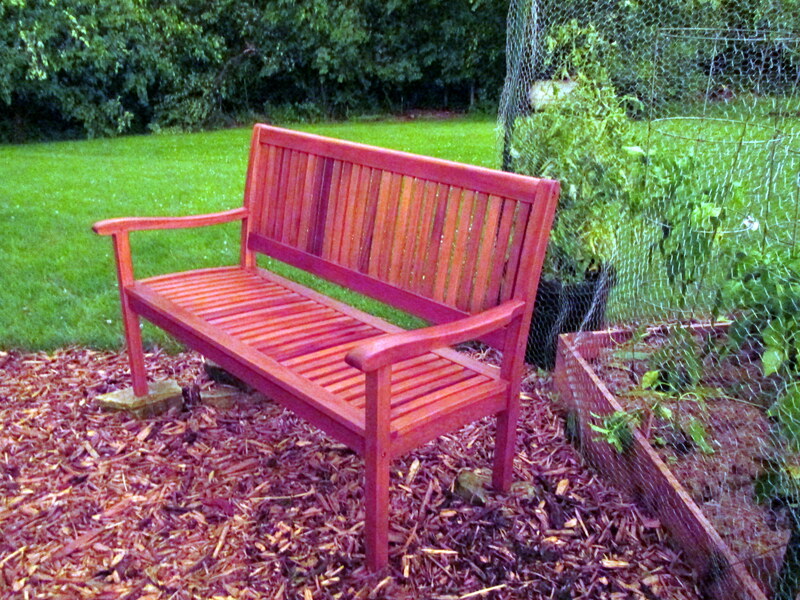 He sits in the garden; the chicken pen is visible at the top left. Where will your chickens live? After checking the local rules, the next thing to do is to determine the appropriate housing for your flock. Also consider your own needs as keeper of the flock. You will want a location that is convenient for you to do your chicken-related chores, which will include feeding and watering the chickens, collecting their eggs, and maintaining the coop and run. Easy access to water and electricity also is a plus. And, because keeping chickens turns out to be so darn much fun, it’s not bad to have a place where you simply can sit back, relax and enjoy your new pets. While you may long to install Barbie’s dream coop in your backyard, the reality is that chickens can thrive in much simpler digs. Prefab units, coop kits, and homemade structures using repurposed materials are all viable options for backyard chicken coops, depending on how much you are willing to spend. In my case, I purchased a Creative Coops brand kit with pre-cut, pre-drilled parts that required painting and assembly. 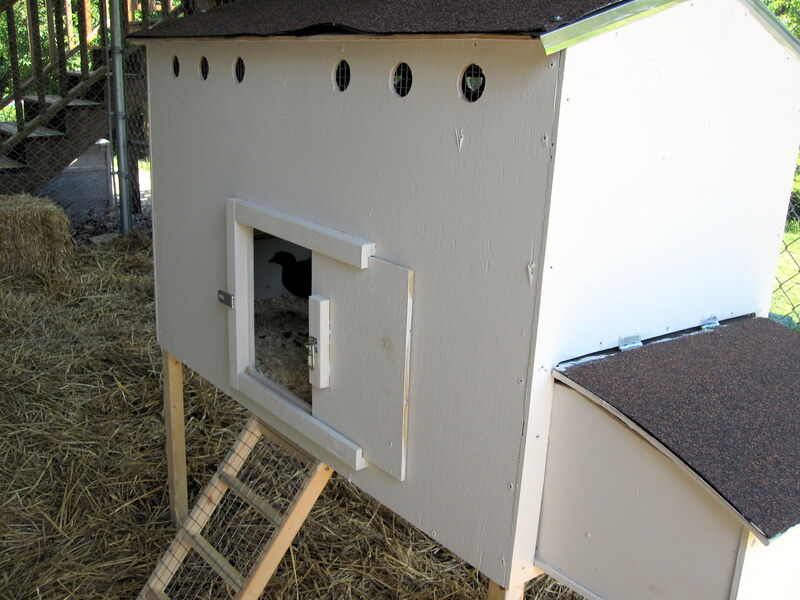 The cost was around $390 for a coop designed to house up to six hens (pictured above). A friend of mine constructed a coop using wooden pallets and a second-hand truck topper for a total cost of less than $50. You can check out his coop here. But if you still insist on that Barbie’s dream coop – and money is no object – you may want to check out this luxury hen house offered for sale from retailer Neiman Marcus for the low, low price of $100,000. Heck, my own first house cost way less than that. Regardless of how much you plan to spend on a coop, you will need to consider each of the following aspects in making your selection: size, elevation, flooring, access, ventilation, roosts, and nesting boxes. Before you buy or build a chicken coop, think about how many and what kind of chickens you plan to keep. A good rule of thumb is 2-4 square feet of floor space per bird, depending on the size of the bird and how much time they will be spending inside. Larger, heavier breeds need more floor space than bantam or lightweight breeds. Birds that will be spending more time inside due to a harsh climate or because you won’t be around to let them out will need more room than those that will spend most of their waking hours outside. Err on the larger side when planning your coop; less crowded hens are happier hens and you may appreciate having additional space to add more birds to your flock later. My first birds in their new home. Consider elevating your coop to simulate the tree-like setting in which chickens roost in the wild. Keeping the coop up off the ground prevents predators from digging their way in. Raising the coop also helps prevent the floor from rotting by keeping air circulating underneath. The space under the coop provides shade and shelter for the chickens and makes a good place for a feeder to keep food dry. The bottom of my elevated coop is fenced with welded chicken wire covered by a plywood droppings tray. The tray can be removed for cleaning but otherwise fits snugly in the bottom of the coop to serve as the floor. A wooden or other solid surface floor is important to prevent foot injuries and deformities that may occur if chickens are forced to stand and sit on wire mesh. Other options for flooring, assuming you choose to not elevate your coop, are concrete and dirt. If using a dirt floor, make sure it is well-drained to prevent the coop from becoming a mucky breeding ground for disease. Also consider burying wire fencing to a depth of about one foot around the perimeter of the coop to prevent predators from digging their way in. Cover the floor of the coop with a thick layer of absorbent material. I use wood shavings, but straw or even shredded paper work as bedding, too. I scoop out the poop daily using a cat litter scoop and add a few more handfuls of wood shavings about once a week. Every few months, I remove the floor completely to give it a thorough cleaning, discard the old bedding (it goes into the compost bin), and replace it with fresh wood shavings. The coop will need to provide access for both you and the birds, but not for predators who might be interested in making a meal of your chickens. The doors to the coop should close and latch, and the latches should be complex enough that a crafty raccoon won’t be able to open them. Tip: Any latch that is easy enough for a toddler to figure out will be easy work for a raccoon. 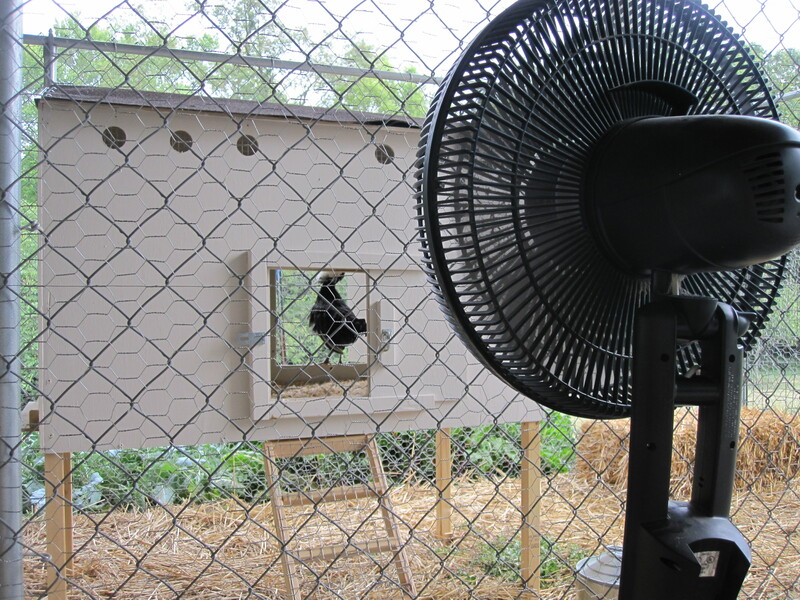 Keeping the girls cool on a hot summer day with the coop’s front and back doors wide open and a fan to create a cross breeze. If your coop is elevated, provide a ramp or ladder to the door the chickens will use for access. While most chickens will be able to fly the short distance from the ground to the elevated coop, some may need the assistance that a ramp provides. Your chicken coop should be well ventilated to provide good air flow and prevent excess moisture from accumulating. Good ventilation is critical for maintaining the health of your flock. Aim for at least 1 square foot of windows or vents for every 10 square feet of floor space. If you live in a warm, humid climate, allow for even more. To keep predators from sneaking in, every vent and window should be tightly screened with 1/2-inch or smaller galvanized mesh. Do not use chicken wire; some predators (like weasels and mink) can squeeze in through openings as small as one inch in diameter. Chickens need a place to roost at night. A two-by-two wood board with rounded edges to simulate a tree branch will give the birds a place to rest their chests and sleep. Do not use metal or plastic perches because those materials are difficult for the chickens to grip with their feet. Allow for about 8 inches of roosting space per chicken (more for larger breeds). The roost should be installed at least 2 feet above the floor of the coop and out of any cross drafts. Hens like dark and secluded places to lay their eggs. Nesting boxes to backyard chickens are like litter boxes to indoor cats; the hens just seem to know that’s where they’re supposed to do their business. My coop kit was designed with a nesting box at one end of the coop, but you can buy ready-made nesting boxes from any chicken supply store or make your own. You just need a sturdy compartment about 14 inches square that is enclosed on all but one side, with a lip on across the bottom of the open side to keep bedding and eggs from falling out. Allow for one nesting box for about every four hens. 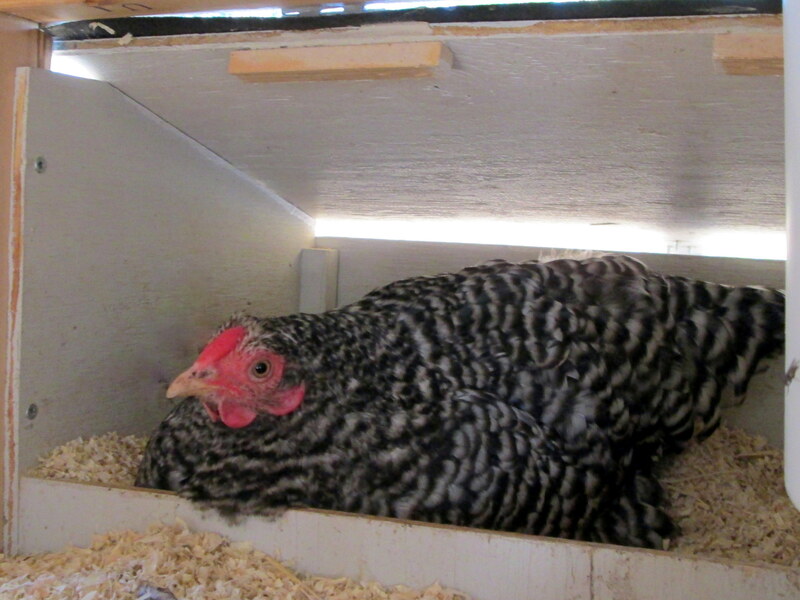 Petunia in the nesting box. The top of the nesting box opens from the outside for collecting eggs. Chickens should have access to the great outdoors. One option is to let them free range during the day and shut them in the coop at night. But free roaming chickens probably aren’t an option in a suburban neighborhood where the only thing between your yard and the neighbors’ boxer is an underground fence and unreliable shock collar. Confining the chickens to a fenced-in yard is a better option for suburban backyards, but many chickens, especially the lighter weight breeds, can fly over a 6-foot barrier. And fences won’t keep hawks and other predators out. Your best bet for keeping your suburban chickens secure – and the homeowners association at bay – is a fully enclosed chicken pen. If your chickens will be confined to an enclosed run, allow about 8 square feet of space per chicken (more for large breeds). Cover the top of the run to keep the chickens in and hawks out. If you don’t plan to lock the chickens into their coop each night, make sure the run is as secure from predators as a locked coop, meaning that you will need to use small-gauge, heavy-duty fencing that predators can’t squeeze or rip their way through, not flimsy chicken wire. Extend the fencing 12 inches into the ground or install the run on an existing concrete pad to keep predators from digging under the fence. Line the bottom of the run with several inches of straw to absorb moisture and neutralize odor, and plan to replace the straw every spring and fall. My chickens are confined to a 6 x 20-foot run with a 6-foot ceiling. One of the most economical ways to add chickens to a suburban backyard is to convert existing, unused structures into chicken housing. Old storage sheds or children’s playhouses are ideal for this purpose. Even an old trampoline frame can become chicken quarters with a little creativity. In my case, we had a 6 by 20-foot dog run with a 6-foot high chain-link fence that we no longer used for our dogs. I realized it would make a perfect chicken pen. It is sheltered by the screen porch and deck above but still gets plenty of direct light, it is built on a concrete pad so predators can’t dig their way under the fence, and it is close to an external water faucet and electrical outlet. To convert the pen to a chicken run, we first wrapped 6-foot high chicken wire around the outside the fence to add an extra layer of protection from predators that might otherwise fit through the chain-links. We also covered the top of the run with additional fencing. Finally, we added a 4-6 inch layer of straw over the concrete to absorb moisture and smell (very important since the pen is next to the house) and to give the chickens something to scratch at. We placed the coop inside the run and were ready to bring our new chickens home. Converting the dog run into a chicken pen. 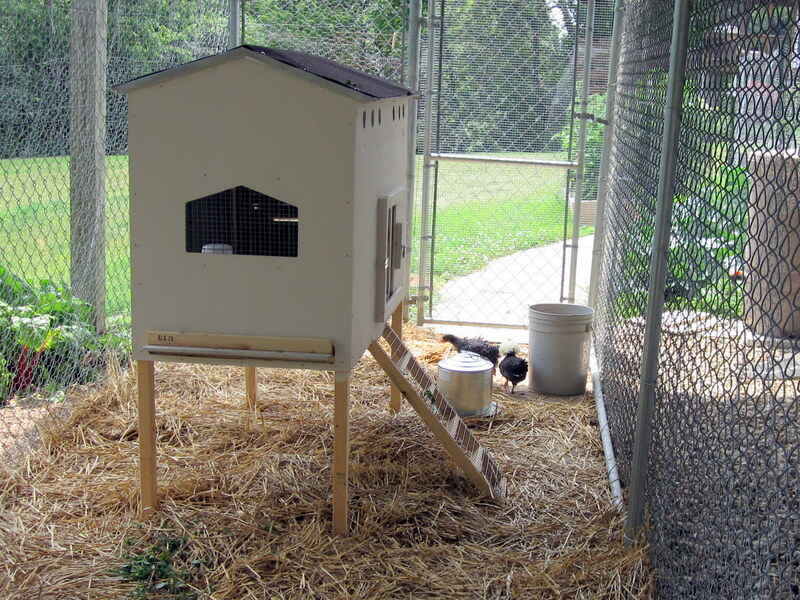 It is critical to consider your climate in deciding how and where you will house your chickens. In hot climates, lots of shade is a must. In wet climates, good drainage will be important. I live in Iowa where the change of seasons can bring dramatic swings in temperature: highs reaching triple digits in the summer and lows dropping to negative double-digits in winter. I took these extremes into consideration in deciding where to house my chickens. The chicken pen and coop are mostly shaded during the hot afternoons of summer, but get direct sunlight during the coldest days of winter. And because the pen is situated close to the house with a deck and screen porch above, it is largely protected from wind and precipitation. Even with this ideal location, I take extra steps to ensure my chickens’ comfort and health during the harsh winter months. I cover the top of the coop with a tarp for additional protection from blowing snow. I run an extension cord from a nearby electrical outlet for a heated base to keep the water fount from freezing. And, to provide a bit of warmth to prevent frostbite on the coldest nights, I use a 60-watt infrared bulb in a brooder clamp light that is securely attached to one corner of the coop. The light is plugged into a thermostatically controlled outlet installed inside the coop that is programmed to turn on only when the coop temperature drops below freezing. 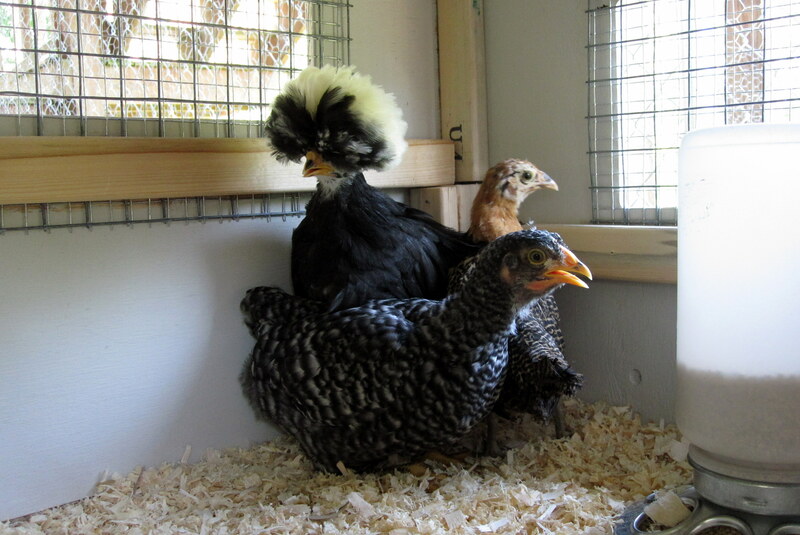 Update: After adding two more hens to the flock, I decided to forego using the infrared bulb in the coop this winter. The coop is small enough that five birds can generate enough body heat to keep themselves warm on cold nights. Using heat in the coop is a personal choice, but be mindful of the risks of fire and of power outages leaving the chickens unprepared for sudden cold. 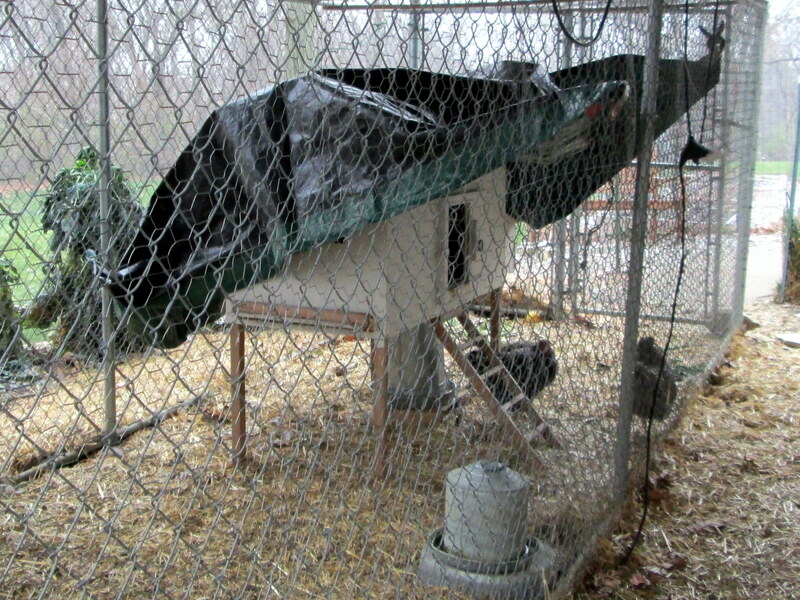 The winterized coop and pen. 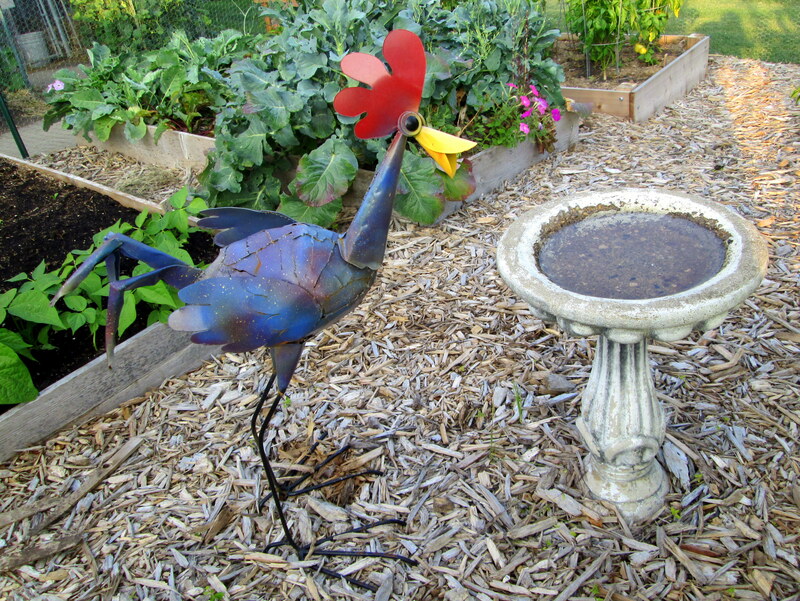 Do chickens have a place in your backyard? Share your stories in the comments section below. This entry was posted in Raising Chickens and tagged backyard chickens, chicken care, chicken coops, suburban chickens by Deborah Neyens. Bookmark the permalink.